A bronze bell molten to create forty-seven little bronze bells. The original was made in France in 1742 and was used to mark the time from a church tower. 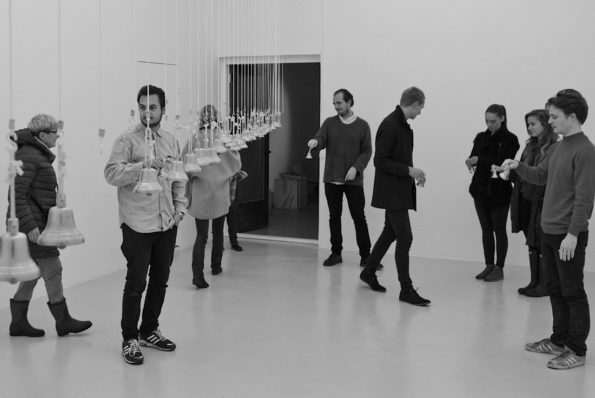 The forty-seven little bronze bells are set in motion daily by forty-seven performers who mark midday as they walk from the New Museum in New York to nearby streets in Manhattan’s Lower East Side. The tinkles gradually distance themselves from the museum, tracing the aimless paths of the bodies of the performers. Describing the work Let Us Keep Our Own Noon made by David Horvitz in 2013, I recall the ding-a-ling of the cowbells in my grandmother’s village in Madrid’s mountain range. If I were to go in search of them now, they would probably no longer be there. In Horvitz’s work, the unified time of Church and State marked by the huge original bell in the tower in the French village has given way to the individualised time of the walking cultural producer. According to the neo-liberal myth, time today is much more flexible, autonomous and potentially adaptable to the needs and desires of each and every one of us. And yet, far from emancipating us, this flexibility synchronises and questions us as permanent producers. The dong-a-ling of the cowbells didn’t mark time but the presence of the animals that ten years ago were replaced by cottages of corrupt face brick. David Horvitz describes jet lag as a liminal space between two other moments, the before and the after. The artist would like to stop time and stretch it out for days, distracting the circadian rhythms that regulate sleep, strength, temperature and action. The project Evidence of a Time Traveller made in 2014 was carried out at the Irish Museum of Modern Art (IMMA). Besides recognising the effects of jet lag on his body, Horvitz included a slide show and a clock with an alarm set for 6.00 a.m. Los Angeles time. Similarly, his work Somewhere between the Jurisdiction of Time made in 2014 already limited this form of disruption. Horvitz declared Los Angeles Blum & Poe art gallery a space subject to the time zone at longitude line 127.5º west of Greenwich. 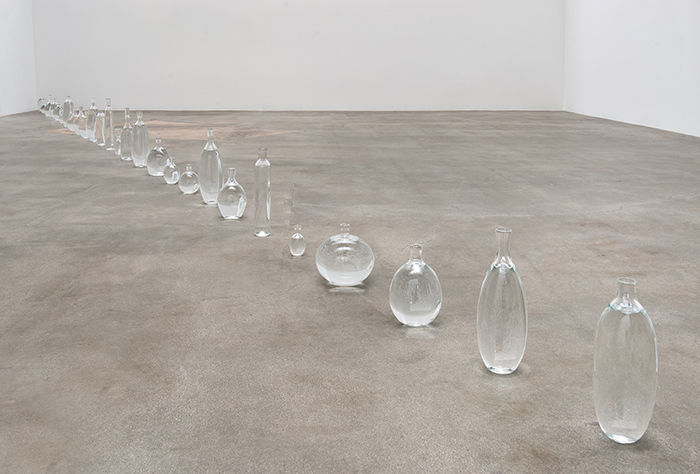 As the point fell in the middle of the Pacific Ocean, Horvitz placed thirty-two glass bottles filled with sea water in the gallery, arranged in a straight line on the floor from north to south. Besides this installation, the artist filled in an official request for the time zone in the gallery space to be changed. Such gestures, indebted to conceptual art, connect his linguistic and temporal games to the practice of global contemporary art. His works frequently include instruments for measuring time such as bells, clocks or photographs. If you visit Horvitz’s website you’ll find another way of documenting the passage of time: Horvitz has organised the site around three columns containing thirty-eight mentions to his works. In each mention, title, date and a concise description are, in fact, links to an audio archive that is, in turn, an oral description of the work. If you click on the 2017 work For Kiyoko (From Amache), for instance, you’ll hear how the generalised fear that reigned in the United States in the early days of Donald Trump’s presidency led Horvitz to recover the memory of his grandmother, a Japanese American who had been sent to a concentration camp during World War Two. Early in 2017, when Trump banned Muslims from travelling to the United States, many of us feared that the same model of forced internment of Japanese Americans would be now adopted against Muslims. Horvitz took a photograph of the starry sky over Camp Amache in Colorado, where his grandmother had been confined. For Horvitz, this view documented the ‘timelessness of space’. The artist installed the same sky that his grandmother had observed daily as a teenager on hoardings in New York City. Although travellers from Islamic countries haven’t been interned by force in camps, today hundreds of migrants from Central America are, thereby closing the circle of time with the forms of federal repression of the nineteen forties. However, the different ways of marking the pass of time are at once mechanisms to control it. For British Marxist historian E. P. Thompson, changes in the sense of temporality over the course of history respond to changes in the ways of disciplining work. Thompson bases his analysis on the close ties between the appearance of individual watches during the Industrial Revolution and the development of rationalised industrial manufacturing as the dominant mode of production in England. Workers’ bodies and time were of greater benefit to the capitalist class once they had all incorporated the time discipline of factory shifts and the working week. Time, therefore, is a bargaining chip. Power, among other things, consists in establishing how time is measured and how that measurement is objectified. In Horvitz we discover a naïve recovery of the rebellious gesture of the Situationists who in the nineteen fifties decided to resume control of the uses and meanings of time. Could their integrated and random Marxist methodologies insist on time as the sphere and prerogative of the individual? Sadly, those analyses, like so many others, were incorporated into the register of methods of exploitation of capital. The illusion of escaping from the economic and productive time we see in Horvitz and others is a romantic, innocuous gesture welcomed in certain spaces of cultural production such as museums and art galleries. It is, in turn, the beautiful sublimation of this contemporary form of flexible, creative time that commercialises each day, hour and second of our working week. In a conversation with Alexander Provan, David Horvitz explains the distinction between kairósand chronos, two concepts of time in classical Greece. Kairósis the timely moment, while chronosis sequential and social time: ‘I would like to experience a world in which the concept of defined duration doesn’t exist, a world in which there is no such thing as a second, a minute or an hour.’ Perhaps his works are attempts to force this escape. Perhaps by some means they are opening the doors to timely moments in order to acknowledge the arbitrary means we employ to measure the passage of life. I too would like to have this experience of expanded time in which the accepted measures of its experience are futile. On Saturday 19 January, David Horvitz inaugurated The Shape of a Wave Inside of a Wave, a solo exhibition of his work curated by Sophie Kaplan at La Criée – centre d’art contemporain in Rennes (France). 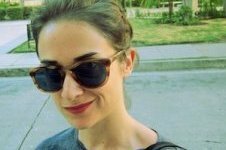 Paloma Checa-Gismero is Assistant Professor at San Diego State University and Candidate to Ph.D. in Art History, Criticism and Theory at the University of California San Diego. A historian of universal and Latin American contemporary art, she studies the encounters between local aesthetics and global standards. Recent academic publications include ‘Realism in the Work of Maria Thereza Alves’, Afterall, autumn/winter 2017, and 'Global Contemporary Art Tourism: Engaging with Cuban Authenticity Through the Bienal de La Habana', in Tourism Planning & Development, vol. 15, 3, 2017. Since 2014 Paloma is a member of the editorial collective of FIELD journal.